The MemberDesq Portal provides an online website where your members can log in, register or renew their membership, update their details and view member only content. This creates a central place online where your members can go to get any information that they might need. 1. 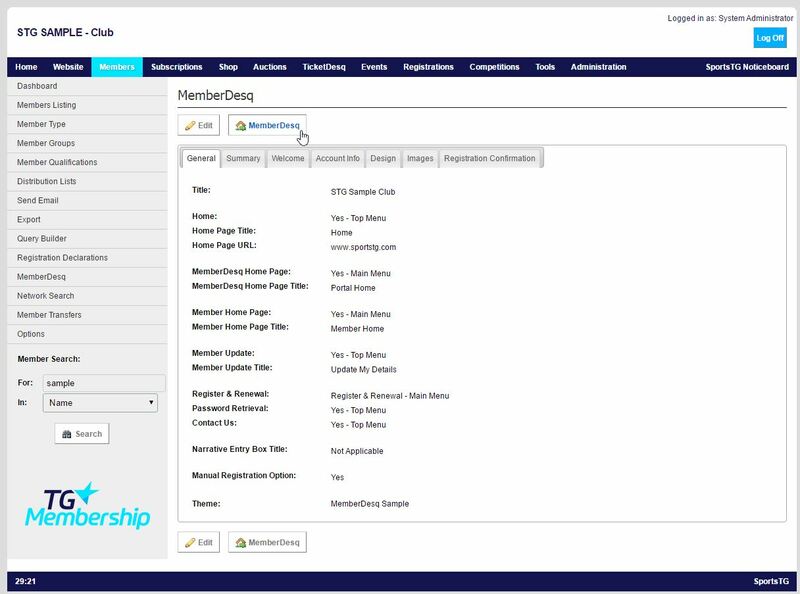 Within the Management Console, select Members from the top menu, then MemberDesq from the left menu. 2. Once your MemberDesq Portal has been configured, click on the MemberDesq button at the top of the page. The MemberDesq page will open in a new window. Copy the entire address of the URL. 3. To add the MemberDesq Portal to an SportsTG hosted website, then click on Website. 4. Select User Defined Data from the left menu, then Category from the expanded left menu. 5. Click Add and create a Menu Option. 6. Give the Category a title and paste the URL into the defined area. Ensure the Category status is set to Online. 7. Click Save and your MemberDesq Portal will now be accessible from your website. Note: If you want to link the portal to a picture, load the picture as a Random Image in the Image Gallery, and insert the Portal’s URL in the Random Image URL area.